Announced during the Innotrans 2008 railway fair in Berlin: Bombardier Transportation has won orders for the supply of 58 Bombardier Traxx locomotives from the leasing company Railpool. The two contracts overall amount to approximately 192 million euros (276 million US dollars). The agreement includes an option for a further 80 locomotives. The delivery of the first locomotives is planned for August 2009. This section is about all Traxx F140 MS units delivered to Railpool, from different orders. From the first 58 units, 28 would be delivered as MS locomotives. The original plan was: 10 x DE/AT/IT, 10 x DE/AT/PL and 8 x DE/BE/FR. However, in 2008, the world was taken over by an economical crisis. This had direct effect on the fleet policy of many Bombardier customers. Orders were put on hold, delivery pace of other orders was slowed down, some were canceled or reduced. Railpool did not change its plans however, and was happy to receive many locomotives originally built for other leasing companies and operators. 186 101-110 DE/AT/IT/CH/NL > originally built for Alpha Trains (former Angel Trains Cargo) in 2006 and 2007. Delivered to Railpool in 2009 to serve RTC/Lokomotion. 186 141, 143, 145, 146, 147 DE/AT/PL > originally built for CBRail leasing, delivered to Railpool in 2009 to serve Polish customers like PKP and Lotos Kolej. 186 181 and 182 DE/AT/NL/BE/CZ > originally ordered by Veolia Transport Cargo, but taken over by Railpool in 2009. 186 271-276 DE/AT/PL > new locomotives built for Railpool. 186 281-285 DE/AT/IT > originally built for CBRail leasing (planned as 186 911-915) but in stead delivered to Railpool in 2010. Bombardier and Railpool have signed an agreement for 20 extra Bombardier TRAXX MS locomotives. The new locomotives for Railpool will be equipped for service in Germany, Austria, Switzerland, Italy, the Netherlands and Belgium (D/A/CH/I/B/NL). Their delivery is planned for May 2018 - December 2019. This latest order increases Railpool’s fleet of TRAXX locomotives to 189. Railcolor: Soon we publish a fleet overview of Railpool on Railcolornews.com. Stay tuned. The work is done! 'Our' Railcolor Design department has successfully completed the Lineas full-wrapping project. 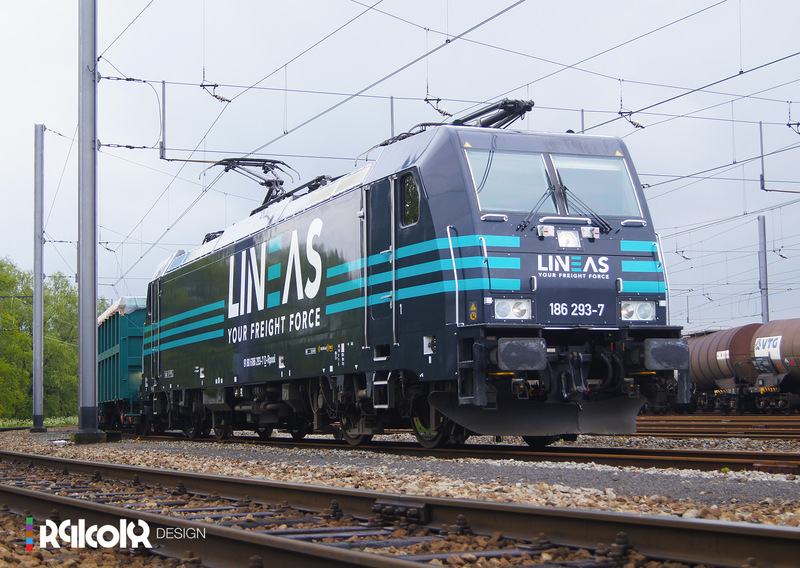 Over the past 6 weeks we have managed the design, production, application and promotion of Lineas liveries for six locomotives, of four different types. Now the new Lineas brand name and identity is visible daily on the railnetworks of Belgium, the Netherlands, France, Germany and Austria. We thank Van Strien Print&Sign, the people of TW Antwerpen and Lineas for the nice cooperation. 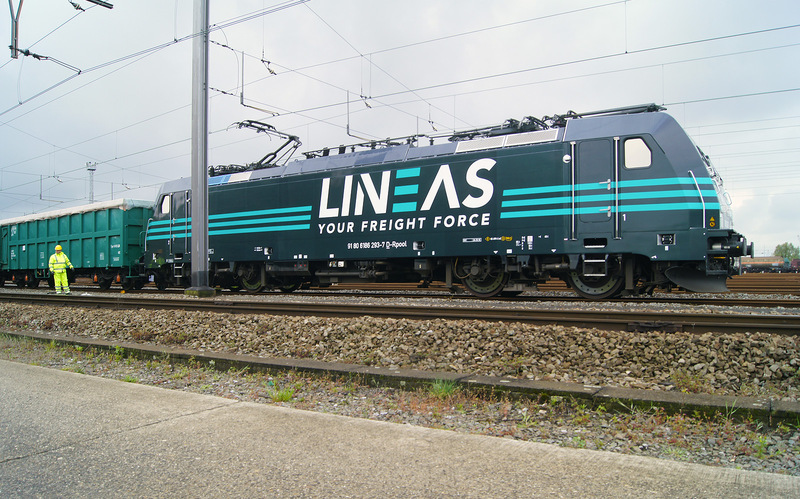 On 03.05.2017 railfreight operator Lineas, formerly known as B Logistics, has presented its first locomotive sporting its new Lineas logos and colors. The images show Railpool > Lineas 186 293 during its presentation at Antwerp. After a festive roll-out, the machine was taken to the freight yard to take on its freight train. The 186 293 is the first of six locomotives in the fleet of Lineas that will get a full wrapping. Next one up is a ‘Reeks 77’ shunter (no. 7789) that will be ready by the end of the week. During the next weeks a second 77, a ‘Reeks 13’ electric, a ‘Class 66’ and a TRAXX locomotive that can be used in France will be ‘Lineased’ too. Very special is that it is one of the very few Railpool lease locomotives that is wrapped completely. We are happy to be part of this project. 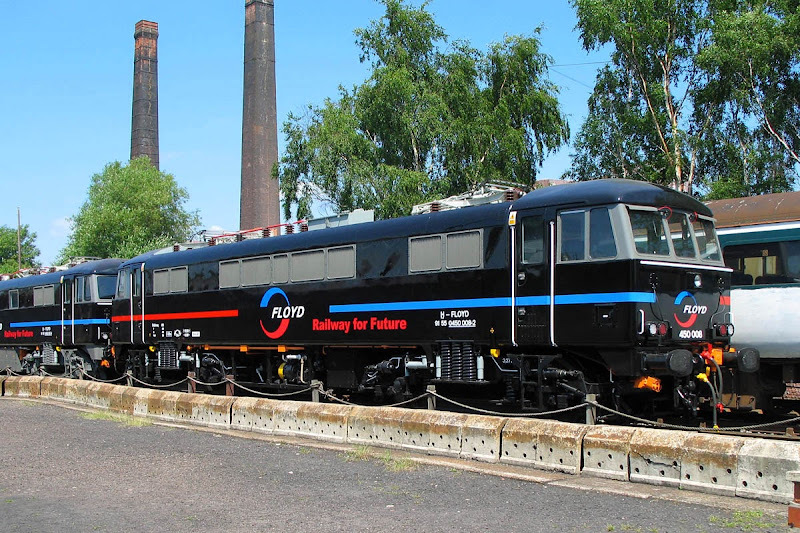 Railcolor Design was given the chance to consult on the application of the proposed designs and is responsible for the project management of the wrapping of all six locomotives. 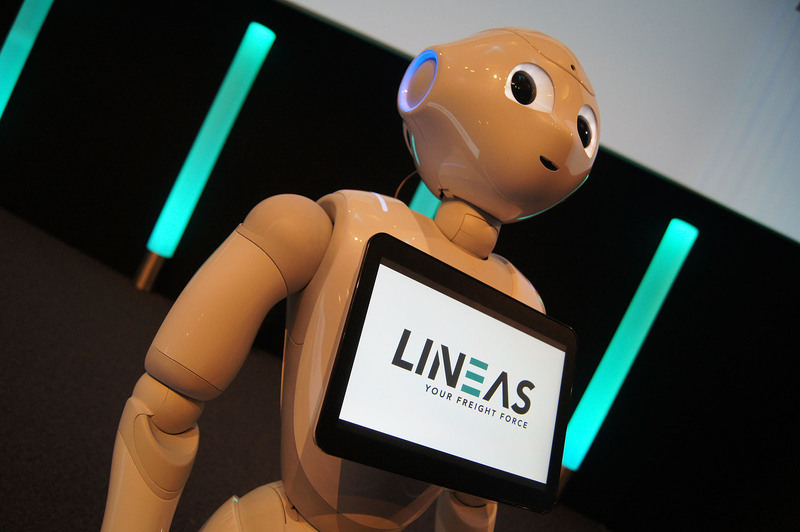 On 27.04.2017, B Logistics has officially presented its new brand identity and name: Lineas it is. Next week, the first rebranded locomotive will be presented, we will keep you posted. Read more on Railcolornews.com. Over the weekend, RailAdventure took three TRAXX locomotive to the south-east of Germany: brand new Railpool 186 445, 187 315 and test locomotive Macquarie Rail 186 236. The first two machines continued their journey to Velim, 186 236 was taken towards Austria. The batch of 17 TRAXX AC3 locomotives for Germany, Austria, Hungary and Romania (187 300-316) for Railpool is almost complete. The only two machines we have not seen yet, are the 187 300 and 314. 2017-03-03 [EU] This is the first DE/AT/CH/IT/BE/NL locomotive for Railpool! [EU] This is the first DE/AT/CH/IT/BE/NL locomotive for Railpool! It took longer than expected, but here is the first Railpool TRAXX MS locomotive with the country package DE/AT/CH/IT/BE/NL, also a Transalp locomotive as are 186 101-110, but additionally equipped for Belgium. The machine is the designated 186 445, that was seen today by Christian Klotz during its maiden run while it was brought to Kassel Rangierbahnhof. While searching for a Czech operator issuing its third tender, we also stumbled upon an entry from the Dutch railways (NS) that "intends to conclude a framework agreement for a period of 5 years (with the possibility for extension for an additional 3x1 years) with all selected suppliers capable of providing (a) lease(s) for (a) TRAXX DABNL locomotive(s) that are suitable for use on the Dutch network, including HSL (High Speed Line) and the Belgian Network (including line 4) and suitable for sandwich operation with the existing fleet of NS Traxx DABNL Locomotives and ICRmh Coaches, on all routes." The end date for interested parties to submit a bid is 03.03.2017. 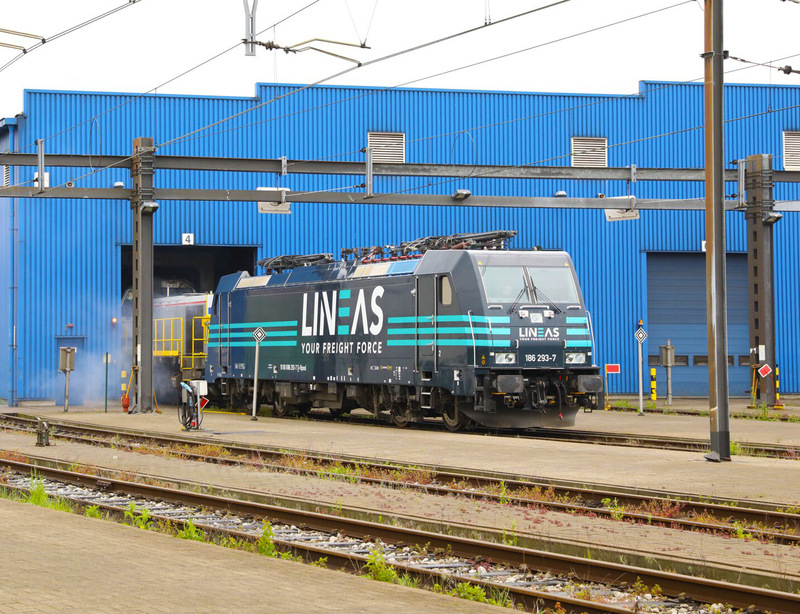 Railcolor: NS is also looking for more DE/AT/BE/NL configured locomotives for pulling Intercity Direct services. NS already has 66 such machines in its fleet (45 in ownership, 21 on hire from Alpha Trains and Macquarie Rail), of which 61 units are currently available to NS' Intercity Direct program. Three other units are being used for software tests: 186 002, 186 122 and 186 236. The workshops in Dessau have just completed a revision 186 240 and 186 237 is subhired by NS to the Belgian railways to pull trains between Amsterdam and Brussels. Remarkable was that 186 253 was sent back to Kassel later that day, plus, 186 252, 254 and 255 did not continue their journey together. They ran separately to Aachen for example, first came 186 254, then 186 255 and 186 252 was the last one. Next to 186 428, also 186 293 comes to Belgium. The machine arrived at Antwerp on 10.12.2016 and will be available to B Logistics. Yep, Railpool is filling the gaps. Currently 186 29x locomotives are under delivery (DE/AT/BE/NL package), and soon a second batch will enter service, numbered in the 186 25x range. Today the 186 252 was seen by Martin Voigt at Fulda during a maiden run. The machine has the DE/BE/FR package, which is new to Railpool. Up til now only Alpha Trains, DB Cargo/ECR and Akiem own TRAXX MS locomotives that are homologated for France. As seen today at Kassel by Christian Klotz. Now in service of RTB Cargo, the all new Railpool 186 292. Steven Oskam could track the machine down today at Zwijndrecht station. Below you see a picture of the all new Railpool 186 292-9, the first locomotive of a new batch, during its maiden run. Its country specific package: DE/AT/BE/NL. Locomotive 186 425 now has the new RTB Cargo logos. Thanks to Jeroen Franssen we have this picture to show you. New software has been installed on Railpool 186 425, so it can be used to perform trials for the Belgium division of RTB Cargo Benelux. In the next few days the 186 425 will haul various trains between the Belgian harbors and Montzen. Thanks Jeroen de Vries. As of February, Metrans Rail is hiring 186 437-0. Now the machine, like the 185 638 mentioned last week, has the full Metrans livery, including the fine blue line. Thanks Andreas Heiser for the quick shot! Since May 2014, Oaktree Capital was the 100% owner of Railpool. It acquired the lease company from its founders: KfW IPEX-Bank GmbH and HSH Nordbank AG. Now it announces that Singapore's sovereign wealth fund GIC has taken a 49% stake in Railpool. This deal provides more financial security for the ongoing fleet expansion of Railpool. Today, Captrain picked up to new lease locomotives in Kassel. From now on, the German freight operator will use the brand new Railpool 186 457 and 458. At this moment, B Logistics is operating a fleet of 47 Traxx MS locomotives from Alpha Trains. Big difference is that Alpha Trains does not offer a full service package (spare parts, replacement locomotives, maintenance and overhaul etc). B logistics has Alpha Trains 186 196-235 (2804-2843) for services in Belgium, the Netherlands and Germany. Units 186 346-350 (2901-2905) are used for service in Belgium and France. Under a separate contract there are also 186 124/125 (2802-2803). BTW, ten machines are currently being used to haul passenger services from Brussels to Amsterdam vv. One is out of service because of considerable damage (unit 186 221). The total series is currently also getting a R1 overhaul, being executed in Salzinnes in Belgium. Siemens and Bombardier meanwhile have expanded their country specific packages of their multi systems locomotives considerably. With the new contract B Logistics has the possibility to hire locomotives with increased interoperability. When you take a look at the B Logistics 'Green Express' network you see the operator wants to connect Belgium with, amongst others, Switzerland, the Czech Republic and Slovakia. These are perfect non-stop destinations for multi system electrics. Railpool has already new Traxx MS machines on order for DE/AT/BE/NL(CZ/SK) and DE/AT/BE/NL/CH/IT, of which the first units have completed their maiden run already. Of the base contract of 2014, 17 of 35 locomotive have been delivered so far (186 421-437). 186 438 is test locomotive for a new package (DE/AT/PL/NL/CZ/SK/HU). The remaining 17 units are planned as Traxx AC3 locomotive. The first one ready, being 187 300 DE/AT/HU/RO with Last Mile module. - MRCE ES 64 U2-096 is in Linz for an overhaul and is repainted in black. - GySEV 1116 061 had an overhaul, lost its GySEV logos and got a repaint in red. It is the first time ever this machine sports OBB word logos (!). - SNCB is hiring 186 424-8 from Railpool as direct replacement for 186 181 (SNCB 2862) that was sent to Aachen for an overhaul. 186 424 lost its RTB Cargo / PCC stickers. In August, Railpool 186 110 was transferred from RTB Cargo to BLS Cargo. This meant the end of the special 'Rail Magazine / RTB Cargo' livery of the locomotive. Now it is silver again, with small BLS Cargo logos, analogue to the livery of 186 107, another recent addition to the fleet of BLS Cargo. Nice detail: the 110 still has big red front numbers, a left-over from its time with Lokomotion. (Yves Gillander). Railpool received three new Traxx MS's, and Lokomotion is reportedly the new lessee of 186 435, 436 and 437. The image shows the three machines going from Kassel to Munich together. Maiden run today for Railpool's newest: 186 436. REV is 03.08.2015, with an impressive country specific package: DE/AT/PL/NL/CZ/SK/HU. However, except for DE and CZ, all abbreviations are covered by black crosses. (Christian Klotz). Various news today about Railpool's newest Traxx MS locomotives, all with DE/AT/PL/NL/CZ/SK/HU package (still theory, for many countries the final approval has not been granted yet). Transchem from Poland keeps operating the 186 429 and 430 for now. The freight company returned 186 143 and 275 to Railpool. The new Bombardier 35183 / Railpool 186 430-5 is now working for Transchem from Poland. New software is being tested. According to its UIC raster, the machine is only approved for Germany and the Czech Republic for now. The machine has a temporary permit for Poland until 30.06.2015 though. The title image shows brand new Railpool 186 431-3 pulling the 'Nievenheimer' freight train from Göttingen to Dormagen-Nievenheim. Behind the 431 is Railpool 185 697 with Novelis logos. Just an image by Janosch Richter. Update: Both 186 429 and 430 have been released from work and run in the Leipzig area for tests. Maiden run on 02.06.2015: Railpool 186 431 with DE/AT/PL/NL/CZ/SK/HU package. As of 29.05.2015, Railpool 186 424-8 is available for revenue service. The brand new lease locomotive was handed over to freight operator RTB Cargo that day. New in the fleet of the Belgian railways (NMBS/SNCB) is Railpool's 186 181. It has a Belgian service number now: 2862. The silver machine is the second machine (next to 186 183 / 2861) of its type used by NMBS/SNCB for Benelux passenger services Amsterdam - Brussels vv. Today, a new Traxx MS locomotive had its maiden run: the future Railpool 186 430-5. It is equipped for services in seven (!) different countries: Germany, Austria, Poland, the Netherlands, the Czech Republic, Slovakia and Hungary. For the first time a Traxx MS locomotive can be used for non-stop services from the Netherlands to Poland v.v. When in Poland, the machine can cover all of its southern neighboring countries too. Railpool 186 430 is the second machine to appear with this package. Earlier we have seen Railpool 186 429-7 being equipped identically. No pictures of this machine though. The brand new Bombardier 35181 / Railpool 186 423-0 (rev 24.04.2015) is now in service of Metrans. Let's see when the machine pops up in the Metrans Lokfinder (it already has, but under the number 186 275). Today, the very first two electrics of the latest Railpool order (35 ordered in June 2014, option for 30) were released from work: 186 421 and 422. Yes, it is that time of the year again. Flower bulbs color explosion in the Netherlands! Perfect decor for Railpool>NMBS 186 183>2861 and maybe its very first Benelux service. Maiden run of Railpool E 186 421-4 today. This is the first machine that is part of the latest order placed by Railpool. The lease company will get new Traxx MS and AC3 locomotives. The Belgian railways (NMBS/SNCB) are now hiring the machine for testing software. A Belgian fleet number will be assigned to the machine. no. 2861. Test runs are expected on high speed lines in Belgium (Line 4) and the HSL-Zuid in Belgium and the Netherlands. On 08.12.2014, Metrans 386 009-5 arrived in the Czech Republic. So now the first nine of twenty units on order have been delivered to Metrans. Interesting news comes from Slovakia and the Czech Republic these days. Various test runs have been reported with Traxx MS locomotives in a new configuration. First there was the Alpha Trains 186 133, now equipped with Mirel MESA 23 (originally this was a DE/AT/PL locomotive). From 19. to 26.06.2014, various test runs were carried out with this locomotive in Germany, Czech Republic, Poland, Slovakia and Austria. Especially border crossings (DE/CZ, CZ/AT, AT/SK, and CZ/PL) were a main topic during these test runs. Now, with Metrans 186 187 testruns are being held, to replace the current restricted appoval of Traxx MS in Slovakia by a full approval. The image shows the locomotive near Chotín during electromagnetic compatibility measurements. This image shows the 186 187 now running between Čadca and Skalité (one-track route, 3 kV DC). Update: new images of tests with Railpool > Metrans locomotive 186 187. Traxx MS locomotives that have a restricted approval for SK at this moment are 186 133, 181, 182, 183, 187, 237, 238, 240, 289 and 291. Predominantly, locomotives in service of Metrans. And this links to background of all these tests. It is rumored that freight operator Metrans will receive new Traxx MS locomotives, approved for DE-AT-PL-CZ-SK-HU. Rail technology leader Bombardier Transportation and the leasing company Railpool have signed a framework agreement for the delivery of 65 BOMBARDIER TRAXX locomotives, with a first call-off of 35 locomotives and an option of up to 30 additional locomotives. The total potential contract value is up to 250 million euro (340 million US). The value of the call-off based on the list price is approximately 135 million euro (184 million US). This contract extends the operating range of the TRAXX locomotives: The MS locomotive will operate on the new East-West corridor linking Poland with the Netherlands. The AC locomotive will operate not only in Germany, Switzerland and Austria but also in Hungary and Romania and will be newly equipped with ETCS (European Train Control System) and Last Mile functionality. The last mile feature, an additional diesel-electric engine plus battery, enables AC locomotives to operate even in non-electrified areas such as terminals, stations or ports – changing locomotives for the non-electrified last mile is now a thing of the past. “With this contract we continue our successful partnership with Bombardier and are able to offer our customers the proven TRAXX locomotives concept. Furthermore, we are developing with Bombardier new corridors and are upgrading our existing fleet with new safety systems, to follow our customers’ demands as a reliable partner for the future”, said Torsten Lehnert, CEO at Railpool. “These innovative locomotives will facilitate rail operation on new, international corridors. They also allow for a much longer range and for more flexibility in operation than ever before,” added Ulrich Jochem, President Locomotives, Bombardier Transportation. The locomotives are designed for speeds of up to 160 km/h. Bombardier will assemble the locomotives in Kassel, Germany, carbodies at its Wroclaw site in Poland and bogies in Siegen, Germany. Propulsion and controls as well as ATP (Automatic Train Protection) equipment will be manufactured at Bombardier's sites in Mannheim and Hennigsdorf, Germany, and Västeras, Sweden. Railcolor: Exact number per version are not mentioned, and sure can change before/during delivery depending on market developments. With this order Railpool increases the number of Traxx locomotives with Last Mile feature in its fleet. At this moment already 8 are built and soon will be handed over (no.187 001-008). New is that locomotives with Last Mile feature will also be available Hungary and Romania. A Traxx MS both homologated for the Netherlands and Poland is new to Bombardier. Only the Siemens ES 64 F4 was available with this combination until now. Last week we brought you the news that Beacon Rail got a new owner. Now another leasing company is being sold. Oaktree Capital has acquired Railpool from KfW IPEX-Bank GmbH and HSH Nordbank AG. On 09.05.2014, funds managed by Oaktree, a leader among global investment managers specializing in alternative investments, acquired all shares of Railpool. The previous shareholders are the two banks KfW IPEX-Bank GmbH and HSH Nordbank AG, each with 50 percent. Both banks will continue to be lenders to Railpool and support the future growth of the company. The purchase price was not disclosed. "We plan significant investments in new, innovative vehicles, the expansion of our excellent team as well as the internationalization of our business. 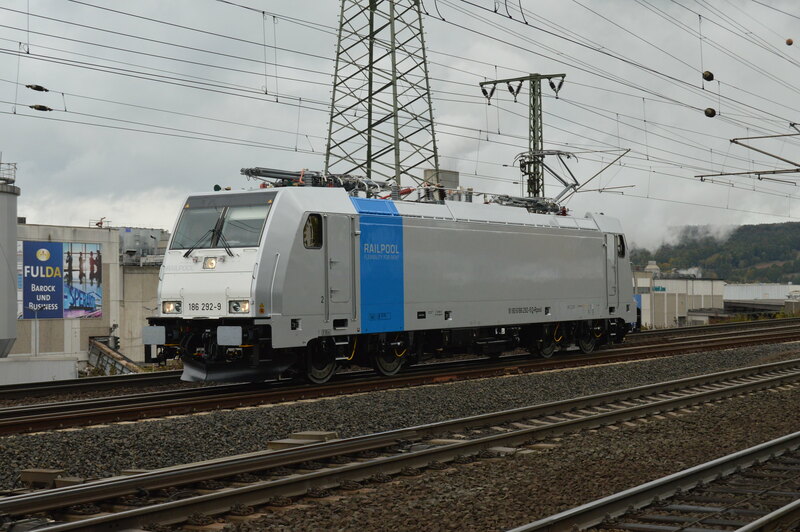 As we continue to offer our customers modern, interoperable locomotives with an attractive full-service package, we are very pleased to welcome Oaktree as an excellent partner, who will support us strategically and financially in our plans going forward," said Torsten Lehnert. In December, BLS Cargo will start managing the 'Melzo' freight shuttles from Rotterdam (NL) to Melzo (IT). 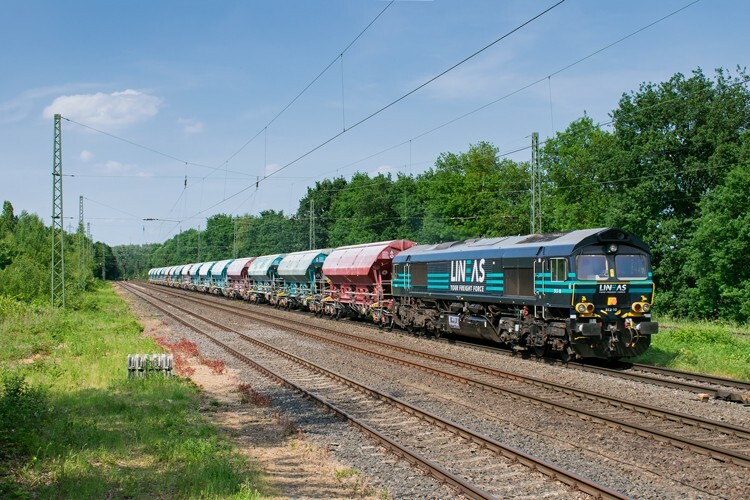 BLS Cargo was awarded with this contract bij ERS Railways in June. 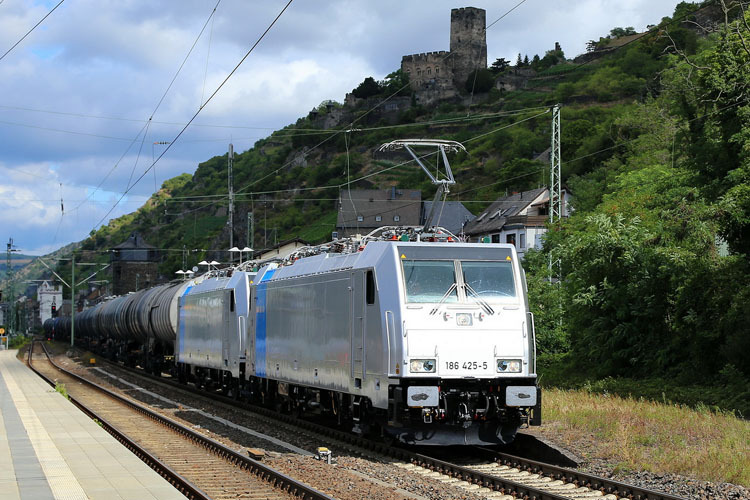 For this contract, BLS Cargo hires the Railpool Traxx MS locomotives that were previously hired to Swiss operator railCare. In return, BLS is hiring Re465/Re425 locomotives to railCare. [update] In the mean time, Railpool 186 101, 105 and 109 have been seen with new stickers for the ERSR/BLS service, promoting the fact that one locomotive is use in four different countries. Since June 2013, Hungarian open access freight operator Floyd is a 100% property of Eurogate Intermodal (64%) + ICE Holding (36%). This has resulted in different liveries for newest Floyd locomotives. The biggest change is the introduction of the Floyd version of the Eurogate logo on the locomotives. For international services in Germany and Austria, Floyd is currently hiring Railpool Traxx locomotives 185 673 and E 186 143-4. Both now sport the new red and blue logos. Floyd also operates former class 56 (0659 series) and 86 (0450 series) locomotives from the UK. The livery of recently refurbished machines is also different. It changed from purple to black with red and blue striping. 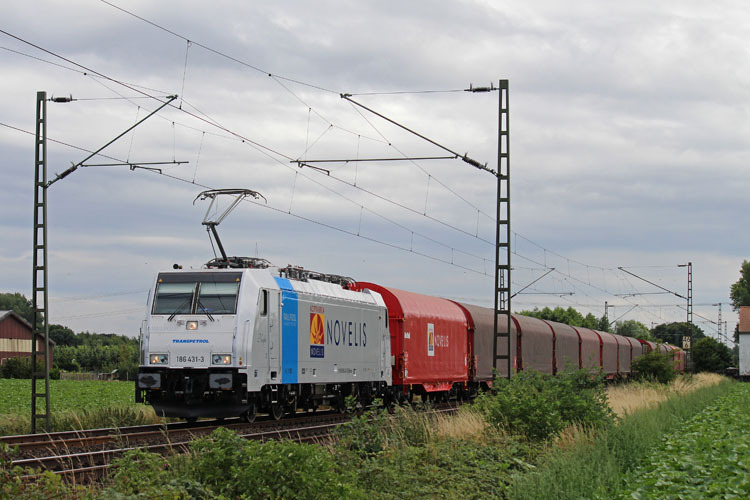 In June 2013, BLS Cargo from Switzerland and ERS Railways (Freightliner) made public that are going to cooperate closely in moving freight traffic between Rotterdam (NL) and Melzo (I). This has consequences for the disposition of several modern locomotives. The number of locomotives available for Transalp services from the Netherlands to Italy is limited. BLS Cargo does not own such locomotives itself, and is not planning to retrofit any, so it had to look elsewhere. Czech operator Metrans hires a new locomotive: Railpool E 186 291-1. The machine was retrofitted in the past months for services in DE/AT/BE/NL/CZ and SK, as it was originally delivered as DE/AT/IT-machine. Today, another presentation of a new livery. Dutch railway publisher Uquilair will celebrate its 35th anniversary at the end of this year. For this special occasion, Railpool/Rurtalbahn Cargo locootive 186 110 is redesigned in a special Rail Magazine livery, the main product of Uquilair. The presentation was held at the work shop of Shunter in the harbour area of Rotterdam. Two hours later, the locomotive started its first voyage in the new design; a freight train from Rotterdam-Maasvlakte to Duisburg. After six months, Koleje Slaskie (KS / Silesian railways) will return the fifteen Traxx locomotives it is hiring from Railpool and Lotos Kolej for its passenger services. Since December 2012 KS is using these machines with hired PKP coach compositions on the Katowice - Gliwice branche. railCare AG is a railway operator from Härkingen, Switzerland. Since 2010 railCare is a hundred percent subsidiary of Coop, the second largest grocery company of the Alp country. Railway transport is a fundamental part of the door-to-door logistic philosophy of railCare. (Frozen) food, non-food, mineral water, salt etc. are transported by train throughout the country. This year it has added four new intermodal hubs to its network in Switzerland, bringing the total to 13. 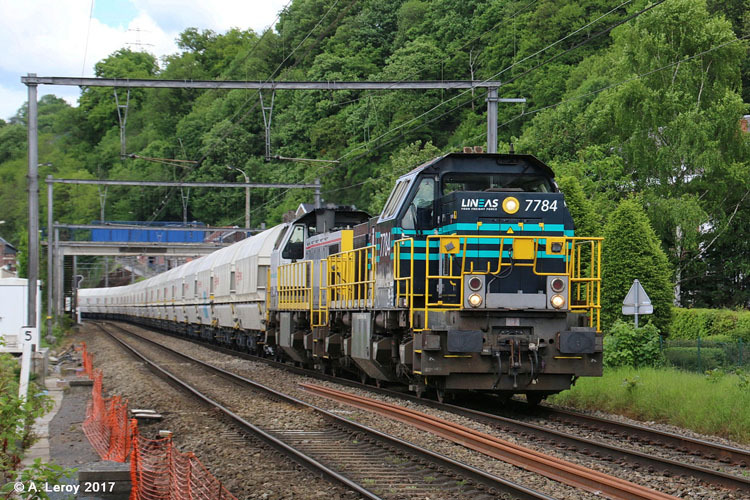 Up until now, railCare has always hired locomotives from BLS or SBB Cargo for traction of its trains. But next december, the SBB locomotives will return to their owner. Therefore railCare will hire machines from Railpool, four in total. On 22.11.2012, the first machines was handed over to railCare in Spiez. 186 104 now has dark blue promotion stickers and the blue Railpool-pendent is replaced by a white one with railCare logos. Today, the machine was sent to Härkingen for staff training. The Railpool locomotives will be used for all services of railCare, except the one to Felsberg. Starting on 09.12.2012, they will haul trains over the Gotthard, Lötschberg and from Daillens to Gwatt. rynek-kolejowy.pl has published the news that Koleje Śląskie (or Silesian railways) have accepted the offer of Railpool and LOTOS Kolej for hiring fifteen electric locomotives and fourty drivers. Railpool/LOTOS were the only party to place a bid. The hiring contract of each locomotive will be valid for twelve months. After four months, either party can terminate the contract. LOTOS states that in no way, this contract will influence the quality of their freight services. On the contrary, they will be able to extend their business model to passenger services. An update with a genuine snap shot, made by the webmaster and his Iphone... It's a picture of Railpool 186 107 running for the Rurtalbahn with brand new vinyls promoting the R2X container shuttle. At this moment, locomotive 186 251 in the welknown Railpool-livery is parked in München-Ost. In the next days, this locomotive will be immatriculated in Italy. If there is a future operator is unknown. Yesterday, Railpool announced a second order for modern electrics. Next to the six Vectrons from Siemens, it expands its fleet until mid-2013 with 36 Traxx locomotives from Bombardier. Railpool already has 58 Traxx units (both AC and MS) on order, the majority of them being delivered by now. And then leasing company Railpool keeps us real busy at this moment. Railpool is really breaking up the market, expanding rapidly throughout Europe, where competitors do not or can not follow. Railpool is even experiencing a serious shortage on new electrics, so extra machines are hired from CBRail. PCT, the German operator of car transports, has returned 185 537 to TX Logistic, and got Railpool's 185 637 in stead. Its hired from CBRail and got a yellow band over its light gray livery. - After being used by the Rurtalbahn for a week or so, the brand new Railpool 185 685 has left Kassel for its voyage up north, to CargoLink, to be operated in Sweden en Norway from now on. The 685 has a red Railpool-band, and with a similar design feature, the 185 682 has been spotted around Kassel. TX Logistic operated Railpool's 185 696 and 697 in Germany up til now, but both units have been re-equipped in the past weeks and are also transported to Scandinavia. Again, LOTOS from Poland will extend its fleet with new Traxx locomotives. They will hire five additional MS units from Railpool. As they are operating nine units at this moment (186 136, 137, 139, 141, 143, 145, 146, 147 and 271) their fleet will grow to 14 units. It's a bit a puzzle, but lets see what we got. Lotos Kolej, operator from Poland, recently closed a deal with Railpool for five Traxx MS units, with an option for three more. Now there is this item, about Lotos recieving six Traxx units today. It tells us Lotos wants eight new units right away (or at least for the next nine months). The image that goes with the article shows us three light grey Traxx MS units with Lotos logos. They are also not repainted in the full Railpool livery, they only have the light blue bar. Yesterday these were already taped in Poland. It must be the DE-AT-PL configurated 186 136, 137 and 139, stored at Kassel since 2008 and originally built for CBRail, hence the light grey livery. The other three newcomers are 186 141, 143 and 145, in service of Przewozy Regionalne (PR) until this week. PR was more fond of the EuroSprinter, so the Traxx units had to go and ES 64 F4-451 to 456 were picked up. Again success for Railpool in Poland. This time the leasing company has signed a deal with operator Lotos Kolej for the hire of five Traxx MS locomotives, for a period of five years. LOTOS can extend the contract with another five years. Next Saturday, 28.11.2009, PKP Przewozy Regionalne will present its first Traxx unit: 186 143. The unit is hired from Railpool and will be used for InterRegio services. The 143 will get a new livery (well in fact only some logos are being put on) and it is expected that PKP PR will hire more Traxx units on the longer term. As you maybe have noticed, not all Railpool electrics which are being delivered right now are brand new units.. It seems that this leasing company is slowly becoming an asylum for locomotives that are unwanted or neglected by other Bombardier customers. E 186 101-110; Since 2006 Bombardier was testing the Traxx MS platform in many European countries using the first batch of 186s built for leasing company Angel Trains Cargo (ATC). But until 2009 none of these ten units were actually delivered to ATC. During the summer 186 101-110 were repainted in Railpool colours. This covers the DE-AT-IT batch of ten for Railpool, although these machines were originally also equipped for running the Netherlands. It is unclear if this still is possible with 186 101-110. Since the summer also a newly built Traxx MS is seen throughout Germany: 186 281. It has only been used for testing purposes so far and it seems to be configurated for DE-AT-IT traffic. Since this week, also units that orginally have been built for leasing company CBRail are being adopted (and adapted) for Railpool. Yesterday 186 143 was spotted in Railpool colours. It country specific package is also changed from DE-AT-NL-BE to DE-AT-PL. Most likely, more CBRail machines are on the shortlist to become a Railpool-member: also 186 141, 145 and 147 have never been used by CBRail yet. These machines partially cover the DE-AT-PL order of Railpool. Then the AC2 units, thirty machines on order, to be numbered as 185 671-700. Three newly built units have left the factory so far, 185 671, 679 and 680, all DE-AT-HU. Two other units, 672 and 673 were originally completed as ATC 185 610 and 611, but renumbered and repainted so Railpool was able to quickly serve its customer EVB, which is now hiring both engines. In the mean time, Bombardier has built a new 185 610 and 611 for ATC to fill the gap. Not all Traxx AC2s will get the DE-AT-HU package, as open access oprator Peterson Rail from Sweden has announced that it will hire 3-5 Railpool AC2 units in 2010. These machines obviously need a different package. 2009-05-01 [DE/IT] E 186 103 Railpool? [DE/IT] E 186 103 Railpool? On 30.04.2009, this image appeared, ATC E 186 103 in a new colour scheme, possibly the one of Railpool! The machine was on its way to Munich. Next week, the 2009 edition of the Munich Transport Logistic Fair will be held there. Hopefully it will bring us more information about this engine.